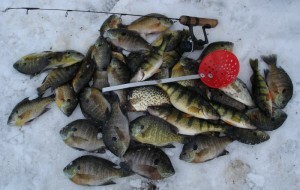 In the winter months the most popular angling activity is ice fishing. To those who have never tried it, ice fishing is sometimes looked upon as an oddity, but for others, ice fishing is the best kind of fishing. 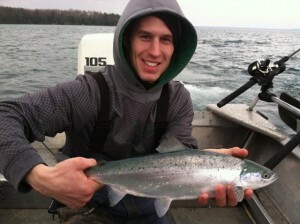 Many die hard anglers actually prefer fishing through the ice to open-water fishing. For one thing, you can get just about anywhere on a inland lake during ice fishing season, something you can’t do without a boat during the open water season. Virtually every fish that’s available to anglers in the summer can be caught through the ice – some are even caught more frequently in the winter. Once you’ve spent a little time on the ice, you’ll soon see a different picture. Ice fishing is more than just a way to fill the long days of winter. It’s a chance to breathe the cold, clean winter air, to spend quiet time outdoors with family and friends, and to relax and collect one’s thoughts away from the hustle and bustle of a busy world. This is some of the finest Atlantic salmon fishing in the world. Casting light tackle at schools of fish, watching them fight for your lure is a sight to see. We also troll body baits and small spoons with great success. Atlantic salmon are known throughout the world to be an exciting sport fish. This native of the North Atlantic Ocean was introduced to the Great Lakes in 1972 when Michigan planted some 20,000 young Atlantic salmon in the Boyne and AuSable Rivers. Two strains have been planted to date, including a strain from Sweden that has been landlocked for thousands of years. Lake-run adults enter their parent streams to spawn, and each river or stream has a characteristic time when this happens. The female chooses a gravel-bottomed riffle above or below a pool, and there she digs a nest, or redd. As she lays her eggs in this depression the male simultaneously releases sperm. Then the female pushes gravel back over the eggs. When spawning is finished the adults may rest in the river for a time and then return to the lake, or the male may remain in the river all winter. Some Atlantic salmon live to spawn more than once. More can be found at www.